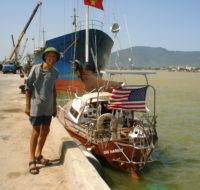 Fleetwoods Circumnavigation » Blog Archive » Tuesday July 9. Getting to the fun part. « Saturday July 6th. No fan of fiberglass. Tuesday July 9. Getting to the fun part. After all the sanding and filling I have something to show for it. 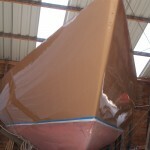 The hull has a fresh coat of paint. This is the first time I had a chance to paint inside. The last time was in 2011 on the banks of the Danube in Zimnicea, Romania and swarms of the little pesty flies committed hari-kiri in the fresh paint. I shall be putting the primer on the deck, house and cockpit, tomorrow. Then the finish coats and the anti slip on the deck and the cabin top. Next the bottom coat and then we are getting close to the re-launch. But lots of hours to re-install all the deck hardware and put the interior back together. Nick, my port side neighbor reflected in the fresh paint job. 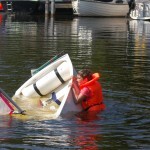 While I am writing the blog a group of youngsters is practicing righting an Optimist dinghy after a capsize. 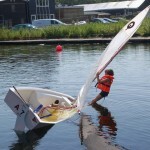 Every summer the club here holds a sailing camp. 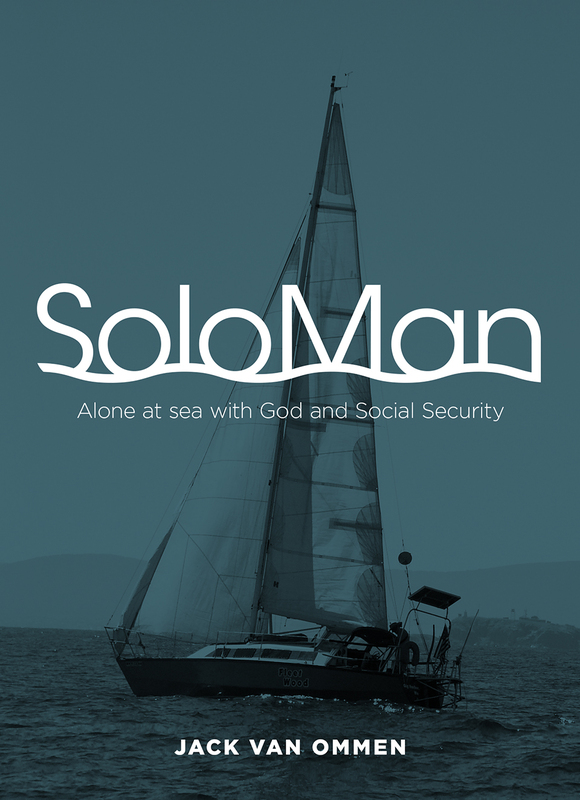 I learned to sail here from my uncle Fred van Ommen in the early fifties. 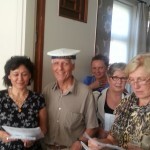 Sunday July 7th: This was the last Sunday, till the fall, that the LPK choir of the Augustinus church sang at the 10.30 a.m. High Mass. The gospel was from Luke 10 where Jesus sends 72 disciples out into the world. They are to greet their potential hosts with “Peace be with you!” “Shalom”. They are to go barefoot and not carry any baggage. To me wishing someone “Peace” is nearly the same as “I love you!”. The very first concert I ever sang in was Mozart’s Requiem mass in 1969 in Brussels. 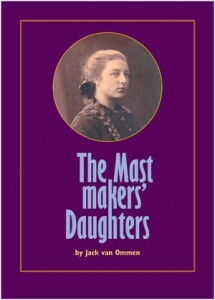 In my book “The Mastmakers’ Daughters” is a passage about several of my mother’s co-prisoners being in the bunker prison of concentration camp Vught in the week before the entire camp population is evacuated to German concentration camps; the women sing the “Dona Nobis Pacem” part of Mozart’s Requiem mass for the male prisoners before they are led to their execution. Last Saturday during my interview Mona Liza asked me: “What about the singing”. And I lost it for a minute or so. The emotion of it is still too much for me. Singing was a major way for these women to support each other and was used in their religious secret meetings. My parents sang in choirs. I love to sing. 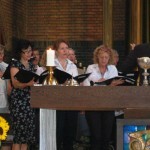 Being part of the Augustinus church choir will remain one of the best memories of the 4 years spent in Europe. I officially said goodbye to the choir members after the service. They sang for me a beautiful sailors song in four voices and gave me a bag of gifts for the continuation of my journey. The director, Herman Paardekooper, said some very kind words. So, I left feeling very blessed. I plan to have a farewell party here at the “Schinkel” when I am ready to cast off. Sometime in August. Stay tuned for the date. Nick, my port side neighbor reflected in the fresh paint job. Typical picture: Jack and the ladies. Sorry, Pete, I can’t help it. Did you see the one I put on just for you on June 17?